Oohood (left) gets her best chance this campaign to shed her maiden tag in the Tea Rose Stakes. After two runs in her spring campaign, trainer Tony McEvoy says Ooohood is now starting to catch up to her Sydney three-year-old counterparts. Oohood runs in Saturday’s Group Two Tea Rose Stakes at Randwick in a bid to finally shed her maiden tag. McEvoy explained having Oohood start her preparation for her campaign in the cooler climates down south meant she had kept her winter coat longer than her Sydney opposition. “It’s a different climate up there and they’re always ahead of us to start with,” McEvoy said. The filly, unsuccessful in eight career starts, has been placed on six occasions and won connections more than $1 million prize money, but has yet to post a win. As a two-year-old, Oohood was Group One-placed in the Blue Diamond Stakes, the Golden Slipper and the ATC Sires’ Produce Stakes. 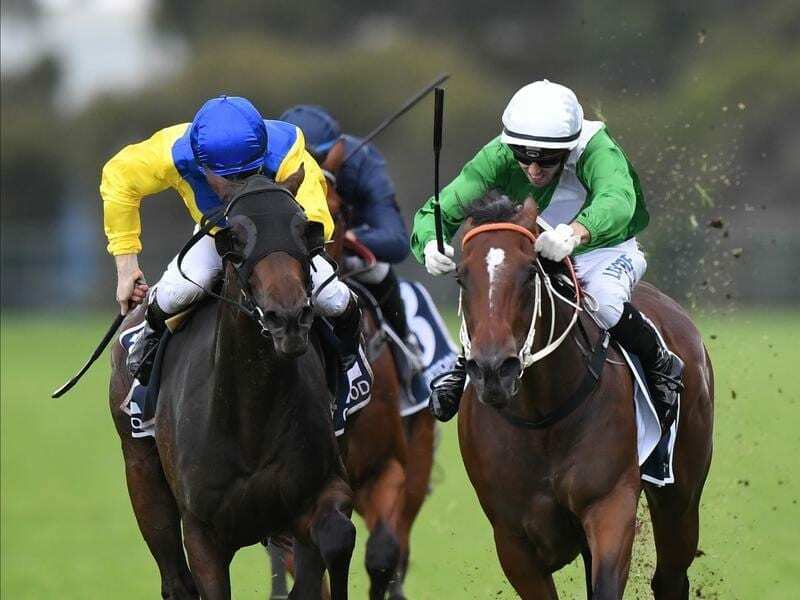 Oohood followed a first-up fifth in the Silver Shadow Stakes (1200m) at Randwick on August 18 with a fourth in the Furious Stakes (1200m) at Randwick on September 1. McEvoy believes Saturday’s race is Oohood’s best chance to break through, especially with the rise to 1400m. “I really believe it,” McEvoy said. “I think her runs have suggested she’s looking for the journey. “She’s trained on beautifully and she’s looking better and better as she’s getting deeper into the prep and her coat is starting to turn. Pretty In Pink is the $6.50 favourite in an open betting race ahead of Silver Shadow winner Fiesta at $7.50 and El Dorado Dreaming at $8. Oohood is on the next line at $8.50.